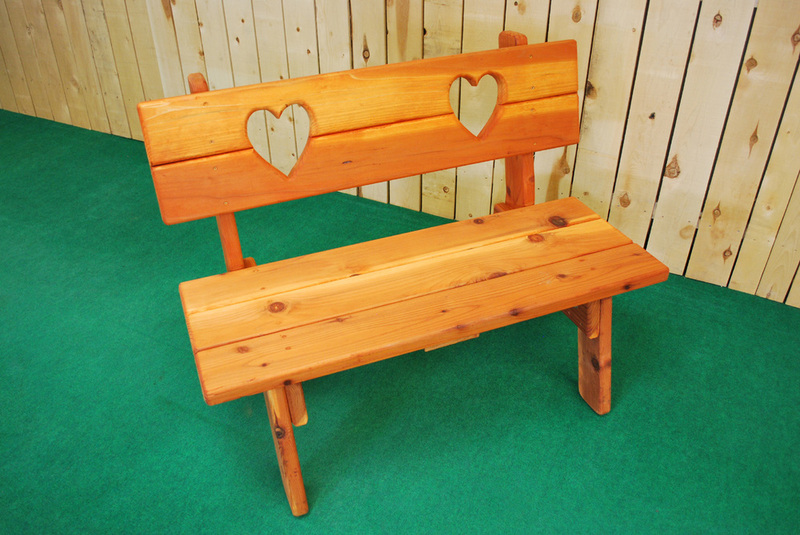 Our naturally cool redwood heart bench has a beautiful simplicity, which is accented with two lovely heart shapes, in its design. Use them for any outdoor setting that suits your taste and style. The backs make them comfortable for activities from enjoying a morning cup of coffee or reading to simply relaxing and enjoying outdoor time. 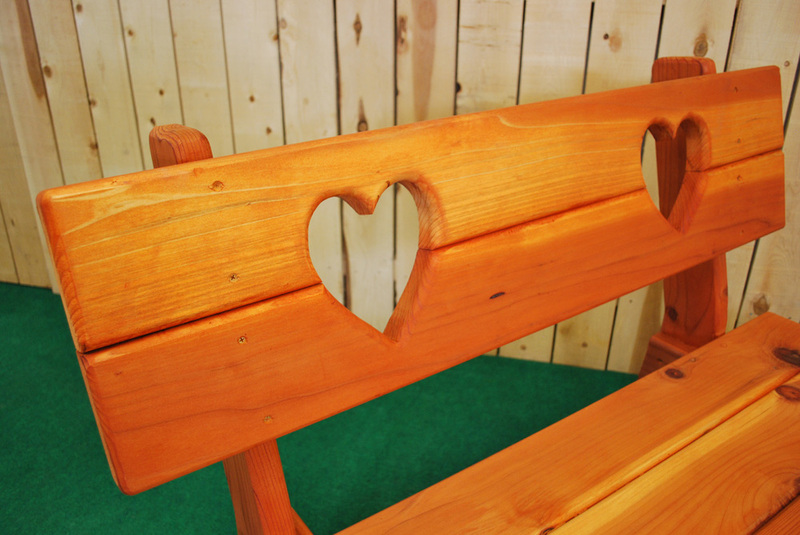 Our furniture is designed and hand built at our store in Northern New Mexico. Contact us or visit our q & a page for additional information. Our experienced staff is ready to answer your questions and provide guidance. Price - $339. Includes shipping within continental USA. New Mexico residents add sales tax. Local area pricing available. Dimensions - 44" long x 26 1/2" deep x 33 1/2" tall. Seat is 44" long x 16 1/2" deep x 17" tall with 11" back rest. Wood - Hand selected redwood. Naturally air dried for a high quality finish. Construction - 2" x 8" band saw cut and angled back pieces. Routered 2" x 6" seat, back and legs. Assembled with zinc coated screws for strength and durability. 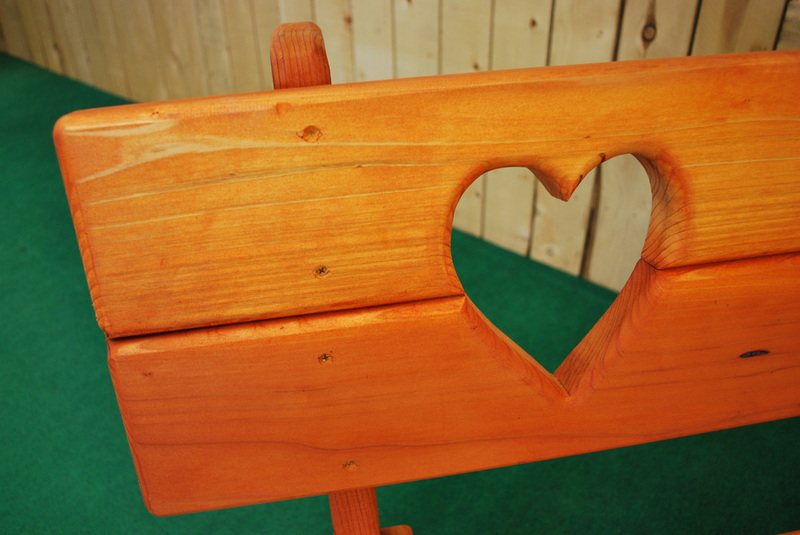 Finish - Sanded and sealed with Penofin Penetrating Oil. Shown in color Sierra. Other colors available. Shipping - Fully assembled on a securely shrink-wrapped pallet to residential or commercial addresses within the continental USA.